This article first appeared in City & Country, The Edge Malaysia Weekly, on January 21, 2019 - January 27, 2019. Located in the popular Karpal Singh Drive in Penang, IJM Land Bhd’s 3 Residence was unveiled last September. “3 Residence is 70% sold, indicating buyers’ interest in the development. We believe the positive response is largely due to the development’s strong value proposition, prime location and realistic pricing,” IJM Land managing director Edward Chong says in an email interview. 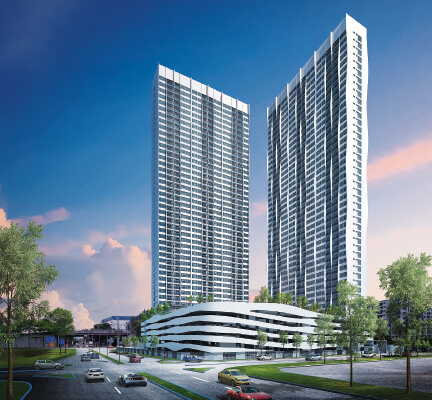 Occupying a 4.51-acre freehold parcel, 3 Residence has a gross development value (GDV) of RM318 million and comprises two towers with 478 apartments. All the units have three bedrooms and two bathrooms with built-ups ranging from 845 to 1,157 sq ft. Prices start at RM551,000. 3 Residence is coming up next to Wesley Methodist School Penang (International). Other nearby amenities are KOMTAR Penang and E-Gate. Its facilities include an infinity pool, a Jacuzzi, cabana, multipurpose hall, play zone, panoramic deck, coconut cove, gym, lounge area and surau. Overlooking Penang Strait, 3 Residence has access to the amenities offered by Karpal Singh Drive that attract residents, shoppers and diners. It will be near the Tun Dr Lim Chong Eu Expressway, the ferry terminal, Penang Bridge, Gurney Drive, Penang International Airport and Batu Ferringhi. 3 Residence is due to be completed by September 2022. Commenting on the overall property market in Penang, Chong maintains that it is still buoyant. “The market has shown some resilience. We believe buyers are more selective. They are attracted to properties that offer strong value propositions, favourable locations and reasonable pricing. “Furthermore, the National Home Ownership Campaign offered by the Ministry of Finance, which includes waiver of stamp duty for first-time homebuyers, will help stimulate the property market. Hence, buying interest in the first half of the year could be sustained,” he says.